Shown here on the Wood eld door style in Cherry. Brittany with Ebony glaze is a Stain with Glaze  nish. Shown here on the Breton door style in Maple. Paprika with Chocolate glaze is a Stain with Glaze  nish. Shown here on the Pearlside door style in Cherry. Burgundy with Ebony glaze is a Stain with Glaze  nish. Shown here on the Recina door style in Cherry. Paprika with Ebony glaze is a Stain with Glaze  nish. 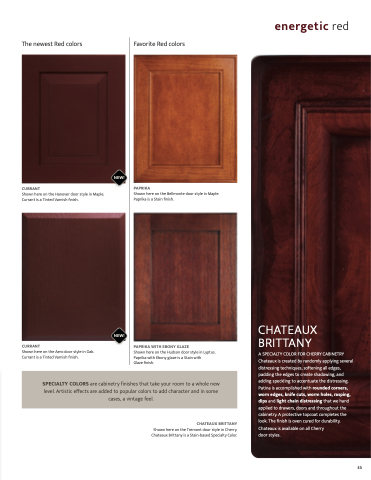 Shown here on the Cologne door style in Cherry. Burgundy is a Stain  nish. Shown here on the Bellmonte door style in Maple. Paprika is a Stain  nish.